Review - When talking about one's teen years most people speak about the freedom but most forget the trapped feeling that tended to overwhelm. As a teenager you are always stuck between who you are and who you will be - whether you follow a well worn path or blaze your own trail. Vivian's Same Difference is a quiet, nuanced look at a specific time in Emily's growth from teen to independent being. There are no easy solutions, no hero on a white stead, no right answers. It is contemporary at its purest - following a relatable character as they deal with life's inevitable quandaries. Art school was a fantastic crossroad setting to contrast with Emily's sedate and unchallenging suburban life. One forces people to conform, to batten down their individualism. The other proclaims it like a badge. It is a universal story, finding yourself stuck between two roads where neither is the right fit. Emily is a character that has always been a supporting player. Comfortable in the background she's never really wanted much other than to break free from the confines of the gated community in which she resides. It is this back foot, somewhat apologetic, aspect of her personality that allows the reader to buy into her obliviousness that propels the story. When you are so used to being seen a certain way, the reality isn't always as clear. Fiona is just the kind of magnetic train wreck that would have me clamouring to be her friend. Confidence is a hugely seductive trait in friends and romantic interests alike and this girl has it in spades. Fiona's denial reflects Emily's own lack of self belief, they are the yin to each other's yan. Bold, brash and manipulative Fiona is the bright, oddly dressed sun that the students orbit and yet their is a fragility and wounded quality that allows the character to breathe despite her shallow nature. Meg could be considered a stereotypes and cliche. The exception is that she's the real face behind the girls who don't necessarily want to branch out. She wants to stay near the nest, attend college and just be. It is easy to dismiss these girls but they are equally as viable as those that wish to fly away. It isn't that Meg doesn't want, she just wants something that is both definable and readily achievable. Her dreams seem smaller because they are almost in her palm. She serves as a worthy contrast to Emily as she's not striving for more instead she's working through having achieved what she wanted and all that entrails. The distance that widens between these best friends can be simply attributed to Emily's physical distance but really comes down to two people that need to reset their image of one another and the way they communicate. Yates is an interesting romantic foil in that she's clearly crushable but there's a lot more going on. His perspective on art and 'making it' add an extra dimension of introspection that assist in establishing the art school and world as more than a convenient setting. This was my first foray into Siobhan Vivian's writing and I am impressed. I am sure some people might read it as a simple story but there is a lot more going on beneath the surface and I really gravitated towards that. She took an aspect of life that is extremely relatable and places in squarely in a world that I was an alien to. Being artistically challenged, the author was able to express different mediums in a way that I could understand on a technical and visual level which is impressive. More than anything, Vivian showed that simple, universal concepts of growing up and changing can be conveyed in familiar but unique ways that can connect to an audience on different levels. 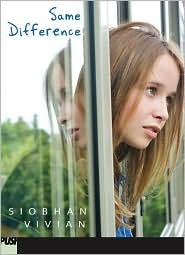 Siobhan Vivian is probably my favorite YA author. Her new book is so great, and this is great, and so is A Little Friendly Advice. You are great, too. This review made my morning. Love Siobhan! And yes, totally, Robby--NOT THAT KIND OF GIRL is awesome. Adele, you'll love it.